Alumni and season ticket holders enjoy the chants at hockey games but find one major problem with them: saying them only three times prevents the rest of the arena from joining in and creating a truly electric atmosphere at the Tsongas Center. The UMass Lowell men’s hockey team is lucky enough to have some of the most passionate fans in all of college hockey. The Tsongas Center has topped Hockey East attendance lists for the past several years and that is due in large part to not only the university’s strong hockey culture filling the student section but the passion of its many season ticket holders. Monty Rodrigues, an alum of UMass Lowell and a season ticket holder since he was a sophomore in 1993-94, has seen some of the most exciting moments in recent UMass Lowell hockey history. He remembers seeing the Old Tully Forum packed with River Hawk faithful (“saying we broke the fire code for the home game [after beating Boston University at its home rink for the first time] is being polite,” he says) cheering on their River Hawks. He is troubled by the hardline “three chants and done” rule that only seems to include the students. Back when he was a student, Rodrigues says that the fans would repeat a chant for several minutes if other people were joining the fun. Tony Patronick is an alum of UMass Lowell and a former reporter for The Connector. As a faithful River Hawk fan, he remembers 2006-07 as the time when students really started to fill the student section at the Tsongas Center. As he recalls, the “three times” rule started then. “Three times was about how long you could get a chant to go with a good participation rate, it just kinda stuck. As more student brought more of their friends, that’s how they observed and learned,” he said. Patronick said that the “three times” rule is fine when a fan is embroiled in the student section, but for anyone outside of the immediate zone it is almost pathetic. “It’s silly now with how big it’s become. It leaves the rest of the arena with no time to join in. Do whatever you can to get them to keep it going. Hint, suggest, threaten, shame; whatever it takes. It’s one of the only blemishes on a great student section,” he said. An anonymous source reached out to The Connector with some more recent intel, stating that two students circulated a list of rules regarding chants starting in 2011. The list is fascinating in its thoroughness. It lists what chants to say during specific moments in the game. According to “The Unofficial Official UMass Lowell River Hawk Chants,” some of the chants were not meant to be said only three times. 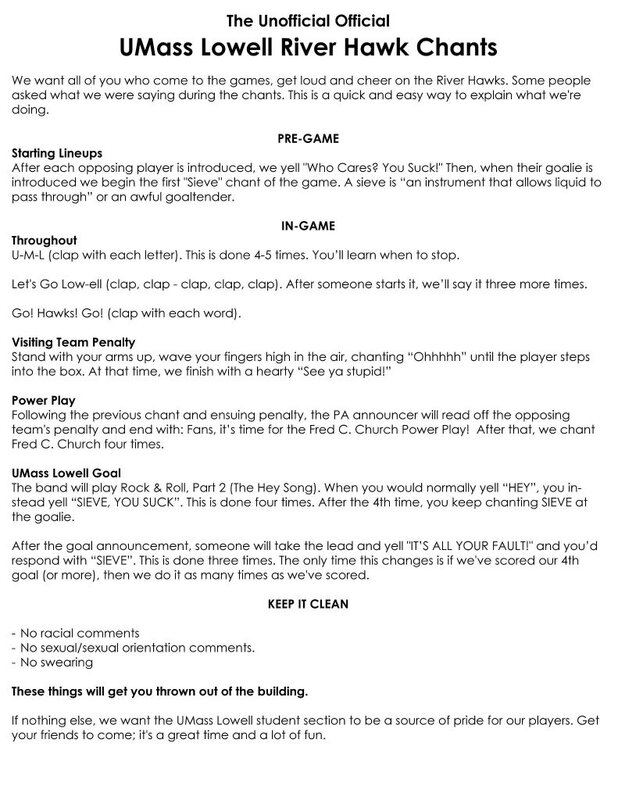 The “U-M-L” chant was meant to be done “4-5 times,” and the list told students that “you’ll learn when to stop.” “Fred C. Church” was meant to be said four times, and there was an extended ribbing of the visiting goalie after they let in a goal. The anonymous source said that as a recent alumnus at the time, even four times was not enough to involve fans outside of the student section. “Out of nowhere the NU students come out at their loudest all night and chant, “You like fish sticks!’” Flanders remembers the game falling on a Good Friday, making the chant more targeted towards the Jesuit university. It had an instant effect on the Boston College students. He finds that recent UMass Lowell chants just are not the same. Joey McKean might be the one to take the reins. McKean is a high school-age season ticket holder who runs Hockey Night in Lowell, a Twitter account that celebrates UMass Lowell hockey. He said that he loves having the student section at games since they bring a special uptick in energy. However, as someone that has traveled around the Hockey East conference for games, McKean finds that the Tsongas Center could be better in terms of fan atmosphere. He thinks that involving the entire arena in chants could very well make that happen. “Please chant things more than 3 times. I know there are many of us who would chant right along with it if we got the chance. If we could get most of the arena chanting student section chants that would be fantastic. The Tsongas Center definitely has the potential to become one of the most hostile environments in college hockey, so let’s become one,” he said.